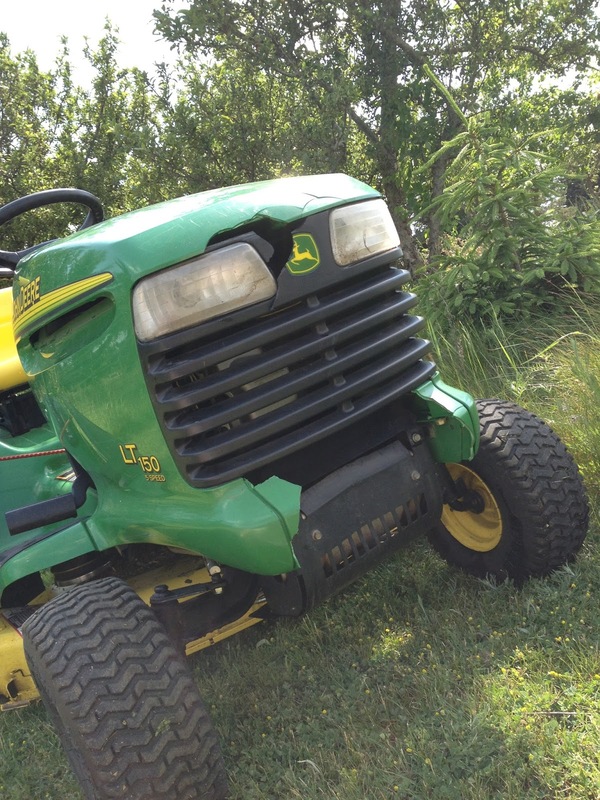 Colored in gaudy green and yellow, John Deere is a bulwark of Americana. Rugged. Reliable. Trusted. Even in my dreams, I never owned one. Long ago I resigned myself to a destiny of off-brand mowing drudgery. Well, I resigned too early. Through a series of fortunate events, I was able to add a Deere to my stable of lawn care equipment. I fondly remember that first season with my Deere. With aplomb I tamed a robust crop of spring dandelions. Summer crabgrass? Child’s play. Fall leaves? Mincemeat! I was in lawn mowing ecstasy. It was joyous to manage my little piece of creation with the real deal – Mr. J.D. You might think my affection for a lawn tractor a bit over-the-top. But if you’re a Deere owner, you know of what I speak. It’s kinda like Jeep owners who plaster on their car, “It’s a Jeep thing.” Well, I have a “Deere thing.” But my “thing” goes beyond my tractor’s turf-taming abilities. On my desk sits a photo of my John Deere. Don’t misunderstand. This is not idolatry (and yes, a picture of Katrina is very close by). The photo is not to admire, but to remember. It’s a picture of the front grill of my tractor – cracked – shattered, really. Beyond repair. A unique photo, for sure. Why? It makes me a better father. Here’s the story. I knew the day would come. It had to. That day when my Deere affections hit head-on with male pre-pubescent driving aspirations. I was reticent to allow my son behind the wheel of my cherished green and yellow friend. But such hand-offs are a manhood requirement – a rite of passage. Yet not everything required is simple, easy or enjoyable. After some overly-detailed and much-repeated instruction, my good ole’ J.D. launched out of the garage with it’s a rookie driver grinning uncontrollably. I tried my best to control the experience. You know, setup my son with a confidence building first-mow. Lots of straight-away with all landscaping (and family pets) safely out of the mowing path. I paced nervously inside the house. I snuck occasional glances out the window. I listened to the speed of the engine and the hum of the blades. Not too fast; not too slow. Things were progressing nicely. My heart rate had settled and my boy was exuberant in this step toward manhood. I was growing; he was growing. Then, in the midst of this Norman Rockwell moment, it happened. The engine slowed. The blades disengaged. The mower stopped. I found a window and cast a bug-eyed stare. My view was partially obstructed, but I could see my son circling the mower. My mind played a dozen scenarios in a matter of seconds. I sarcastically mumbled to Katrina, “This isn’t going to be good.” After several minutes of circling, kneeling, pausing and doing nothing my son was back at the helm. The engine throttled to full speed and mowing continued. I was red-lined with curiosity. A twitch of anger raced down my temple. Worst-case scenarios continued to play on the screen of my mind. The circumstance was ripe for a potent father/son interaction. An interaction heavy with growing-up, letting-go and man-making. As the noise of the tractor echoed in the garage, and then subsided, I sighed. And waited. And prayed. Then the door opened. The rest of the story I’ll leave to your wondering. The truth is captured in that photo on my desk. When I look at that picture, it’s like picking a scab. The pain is renewed. Selfish pain born in materialism. Vicarious pain for my son and his mistake. Soul pain because of life’s brokenness. The pain pushes me deeper into my fathering. It broadens my view and helps me see that life is bigger than me – and my tractor. To see that I’m not in control. To see that bringing life to my son’s manhood means some things in me must die. G.K. Chesterton said, “A true soldier fights not because he hates what is in front of him, but because he loves what is behind him.” Loving what’s behind means I do the hard work of true manly living. It means I welcome being broken and the moments of clarity and self-reflection brokenness brings. It means I expand gratitude for my heavenly Father who watches me break the metaphorical grill day after day – yet responds with grace. Thanks, Abba.